Ts.Munkhtsetseg. A teacher of NUM. Certain issues on the manipulation in politics of Mongolia. The manipulations or the attempts of the ruling authorities to change the public opinion in their personal favor, have been made use of in the political practices from early days. Under the present conditions in our country where the culture of democracy has not been shaped yet especially among the public, where the political influence on public and mass press media, I have touched upon the given topic for the reasons of challenging necessity to undertake a survey on the manifestations and impact of the manipulation pertinent to our country. E.Gerelt-Od. A teacher of the Political Education Academy. Democratization of Political Parties in Mongolia. Establishment of a great number of political parties constitutes one of the valuable basic sticking points of democracy and there is no hesitation that it will determine the quality of democracy in Mongolia further on. The matter is that it is suspicious to assume that a country in which there are functioning many political parties the democracy gets a sustainable development and progress. The main reality is that the destiny of to be or not to be for a democracy in the given country depends on how the political parties sharing the governance of the country are democratized. 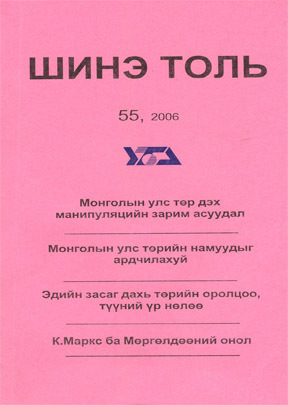 In the light of the above the author in the present article has forwarded a goal to reveal the interdependence of political parties and democracy, the advantages and disadvantages of a democratization of political parties in Mongolia as well as to disclose the opportunities available for them to be democratized further and to display our chances for a better future. Yu.Atar, B.Batzorig. Teachers of the Social Sciences Chair of the Educational University of Mongolia. Trends in the development of a Civil Society. For the society being a complex unity of a great deal of various notions has a specific system of its own. The understanding on any social system provides with its social structure, organizing, means and methods of regulating the relations, forms and patterns of a system established in it, and a comprehensive notion of the manifestation of the means and ways on its development. According to the history of the social civilization of the mankind it is clear and evident that any of the versions and models and patterns of development is based on one definite theory, methodology and concept that had been summarized, appraised and thoroughly developed. In connection with this there arises an urgent need to take up where what kind of concept is being pursued to regulate the social relations there the development advances. Ch.Tamir. A teacher of NUM. Have we a concept, program of action and policy? When we have conducted a research survey on the events being developed in the society, it has enabled us to come to a conclusion to propose prognostic views that Mongolia is prepared to practice deep and fundamental changes, but these events will be more powerful within the framework of political environment. This assessment conclusion is meant to make the political parties and the governing authority to understand and recognize the real conditions occurred in the society, in the country as a whole and we have to study further on thoroughly the interrelations of these events, their interdependence, moreover, reasons and factors related to them. If you have glanced attentively at the above document, it is anyhow clear that the reasons and main sources of the crisis are somewhat related to political parties. But party is an abstract understanding and behind it there is present a human being, nothing more. Accordingly, we will touch upon and dwell on the issues of party concepts, programs of action and moreover their policies as well. M.Bolormaa. Master in Political Situsies. Chief of the Office of National Committee on Gender Equality. Women and Empowerment. I have selected this topic of women and empowerment by touch upon the issue of the women and their empowerment, the increase of their participation in the decision-making by the state authority on women and their empowerment. It should be always born in mind that a woman before making any decision should first of all think well and thoroughly on the subject, not to forget the perspective goals merely for the intention to earn a political favor and advantage. D.Bold-Erdene. Doctor of Political Sciences. Legal Thinking in the Great Mongolian Empire of 13th century, “Political and legal significances of “IKH ZASAG”. The tradition of legal thinking represents one of the integral parts of the political concepts and thinking of the Great Mongolian State. As is known politics and law are the two integral sides of one phenomenon that has a tough interrelationship. It shall be impossible for the law to exist without politics like it is unimaginable the existence of politics without legal regulations. The legal regulation is based on politics and the politics takes its orientation and live in law and thus getting its directions and formation shaping. In this very sense if the issue on political thinking is taken up, the issue of legal thinking naturally stems out simultaneously, which is a natural law. B.Battuvshin. An official at Conrad Adenauer Foundation. On the Issue of initiating and strengthening Local Management. Whether the regulations to be introduced into the functioning of Khurals and Administration management does represent a problem to be settled within the frames of the so called notion local self-governing? Yes, surely. These are the internal issues of the composite notion: local self-governance. But they do not represent yet the primary and determining factors to ensure the decentralization and the local independence. Accordingly, we, in order to secure the local independence and the weakening its centralization, first of all, have to get a common understanding on the basic and primary problems as a priority, on how to solve these problems. L.Otgontuya. A teacher of the Public Management Chair of the Management Development Academy. Participation of the State in economics and its influence. The cardinal problem of the country’s sectoral as well as entire economic reforms stands to be the upgrading the influence of the public participation in the economy. The issue of diminishing the participation of the state power in the economy of the country, increment of the influence of the state regulation in economy remain as a problem of a paramount importance for the state regulation both for the countries with transitional economies and those with market oriented economy. One of the pressing problems of nowadays to be studied and dealt with on the issue of the renewal of the public administration and public participation becomes inevitably the problem of a detailed defining the assignment of the state power participation in the economy and improving its influential input taking a basis of the reforms experiences of other successful countries of the world. R.Bold. A researcher. K.Marx and a theory of Collision. The economist Marx (creator of the theory on added value) has intentionally put himself against capitalism as well as the classic economists headed by Adam Smith and though he has considered them to be his opponents, most of his conclusions on economics had borrowed from the classic tradition. In terms of technical understanding the economy of Marx has not a great difference from that of the classic economy. But Marxism is something different. It differs for its general objectives directed to conduct economic assessment and analysis. Economic assessment analysis means for Marx himself the comprehension of factors on social changes and he tends to direct them to influence on and help the new environment of the society.